A variety of steam cleaners are available for use on flooring, and while some as marketed as being designed especially for hardwood, these claims should be viewed very cautiously. Hardwood is naturally a very absorbent material, and exposure to water can cause it to plump, warp, twist, and mold. A steam cleaner by its very nature uses water heated to a very hot vapor to clean and disinfect the surface of a floor. This vapor is able to get down into cracks and crevices to kill germs and bacteria, but when used on a hardwood floor, the moisture can stay down in the cracks and crevices, leading to problems in the future. 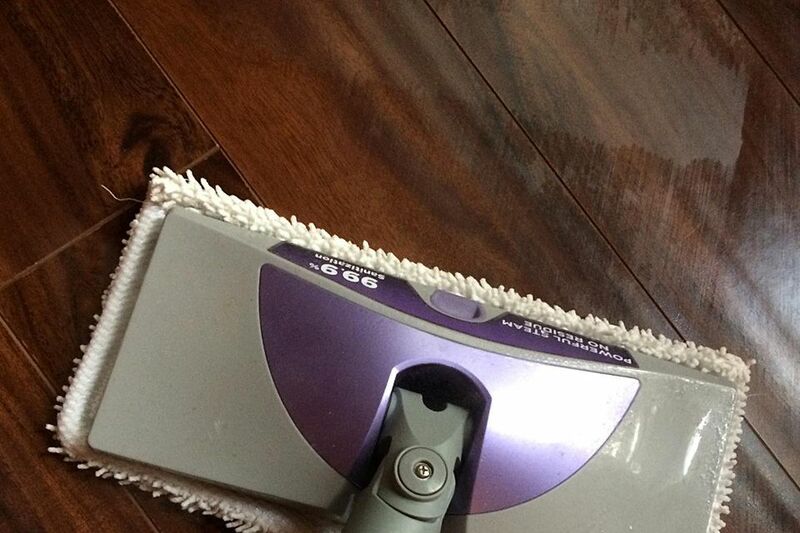 What About Steam Cleaners "Designed" for Hardwood? There are several companies that are selling steam cleaning machines that are supposedly able to clean hardwood floors safely. The reason these claims are made is that these cleaners have a function that wipes up excess moisture as it moves along the floor, absorbing the water and supposedly leaving the floor dry. Product literature on these machines is careful to note, though, that floors must be properly sealed in order for the tools to be safe on them. But despite the existence of these machines and the claims their manufacturers make, all of the major wood flooring associations agree that steam cleaning devices should not be used on any hardwood flooring surface. There are no major hardwood providers who recommend the use of these products on their materials. The National Wood Floor Association (NWFA), in NWFA Technical Publication No. C100— "Maintenance and Recoating of Hardwood Floors 2010," states on page 5 that "Using steam or excessive water may damage a wood floor." In addition, Consumer Reports magazine states that in an independent test of steam cleaning machines “all the tested models left residual moisture, some more than others”. The presence of lingering moisture is enough to cause damage to even the tiniest cracks in the surface seal of a hardwood flooring installation. All steam cleaners come with a warning that you must make sure the floor seal is intact before using their machines on the hardwood. In order to test the thickness and durability of the seal protecting your hardwood floor, drip a small amount of water onto its surface. If the water immediately beads up, then the seal is intact and the floor cannot be penetrated. But if the water spreads out or sinks into the wood, then the seal has been compromised and needs to be reapplied. The thicker and more durable the sealed finish is, the more resistant to steam damage it will be. Note: The quality of the seal can vary from location to location across the floor. You have to test it in several locations to be sure of its overall integrity. Wood seams: Even if the wood itself is perfectly sealed against moisture penetration, the seams between the planks can be vulnerable. Although seams are initially sealed during the application of top sealers, as the wood creaks, shifts, or contracts with use and weather, the seal inevitably gets cracked, allowing moisture to penetrate down and attack the floor from below. The impact of steam: The steam itself presents a unique problem with hardwood. Water is a relatively thick substance. Steam, by contrast, is very light and thin and can easily penetrate even hairline fractures on a surface. This allows it to move down the side of hardwood planks, or slip up from underneath, attacking the floor from every vulnerable angle. As the vapor cools and condenses back into liquid water, you are left with moisture that can damage wood fibers. Using steam can void the flooring's warranty: Most hardwood flooring will come with a manufacturer’s or a retailer's warranty. This will outline how long the floor should last under normal usage and guarantees its replacement if the material fails due to structural problems. These warranties often come with explicit conditions about which acts will void their protection—read carefully to determine if steam cleaning is a protected action under your floors explicitly stated warranty. Engineered hardwood flooring products are manufactured materials made by taking a thin layer of real hardwood and adhering it to a filler backing. A clear wear layer is then placed over the surface to protect that thin hardwood layer from damage. The advantage is that the wear layer provides a very hard, durable, easy to clean surface, while also preserving the look of natural wood. These products can be considerably more affordable than solid hardwood, yet look almost as nice. But engineered hardwood flooring products are subject to the same problems with steam cleaners. The wear layer generally tends to only protect the top surface of the laminates, which means that while the top is perfectly safe, the sides, seams, and bottom of the planks and tiles are all vulnerable to liquid steam. In fact, since the steam can degrade the adhesives used in the bonding process, the danger of damage is actually even greater with engineered, laminate hardwood flooring. The National Laminate Flooring Association (NLFA) does not endorse the use of steam cleaning machines on any laminate flooring. Unlike hardwood and laminates, vinyl is a completely man-made material. Despite the fact that it may accurately reproduce the appearance of hardwood, it is impervious to harm from moisture and can be easily treated with a steam cleaner without having to worry about harming the floor. There are now ceramic and porcelain tile products designed to look remarkably like woods, and these, too, are perfectly safe for the use of steam cleaners.